Myocardial rupture occurs in the setting of acute myocardial infarction (AMI), blunt and penetrating cardiac trauma, primary cardiac infection, primary and secondary cardiac tumors, infiltrative diseases of the heart, and aortic dissection. Myocardial rupture (or perforation) may also occur iatrogenically during percutaneous cardiac procedures (including device implantation) or open heart surgery (particularly valve replacement). Recently, myocardial rupture has been reported in the setting of stress cardiomyopathy (Takotsubo or regional ventricular ballooning syndrome). The clinical presentation of myocardial rupture depends on the mechanism and site of injury and the hemodynamic effects of the rupture. Mortality is extremely high unless early diagnosis is made and urgent surgical intervention is provided. Ischemic myocardial rupture after AMI may involve left ventricular (LV) and right ventricular (RV) free walls, ventricular septum, and LV papillary muscle, in decreasing order of frequency. It rarely involves the left or right atrial walls. In most instances, the catastrophic clinical presentation occurs within 3-5 days of a rather small AMI. Both hemodynamic factors (increased intracavitary pressure) and regional myocardial structural weakness (myocyte necrosis, collagen matrix resolution, and intense inflammation) can make important contributions to myocardial rupture in the setting of AMI. In rare instances, patients simultaneously experience LV free-wall rupture and ventricular septal or papillary muscle rupture (double rupture) after AMI. Rupture of both papillary muscles after AMI has been reported. In the case of a papillary muscle rupture, the posteromedial papillary muscle is twice as likely to rupture as the anterolateral papillary muscle is. This is because the anteromedial papillary muscle is more often supplied by 2 arterial systems (the left anterior descending and left circumflex coronary arteries), whereas the posteromedial papillary muscle is frequently supplied by only 1 coronary artery (usually the right). In some patients who survive LV free-wall rupture following AMI, the rupture can be sealed by the epicardium (visceral pericardium) or by a hematoma on the epicardial surface of the heart. This entity has been referred to as LV diverticulum (or contained myocardial rupture  ) and represents a subacute pathologic condition between free rupture into the pericardial cavity and formation of a pseudoaneurysm. A pseudoaneurysm is formed if the area of rupture is contained locally by the adjacent parietal pericardium and represents the chronic stage of LV free-wall rupture. The most common etiology of LV pseudoaneurysm is AMI. (LV pseudoaneurysm is twice as common with inferior AMI as it is with anterior AMI.) LV pseudoaneurysms may also develop after surgical interventions, especially after mitral valve replacement. Blunt cardiac trauma, most commonly occurring in the setting of an automobile accident, may cause myocardial rupture as a result of cardiac compression between the sternum and the spine, direct impact on the heart (sternal trauma), or deceleration injury. It may result in rupture of the papillary muscles, the cardiac free wall, or the ventricular septum. The cardiac chambers involved are, in decreasing order of frequency, the right ventricle, the left ventricle, the right atrium, and the left atrium. However, among patients who reach the hospital alive, the right atrium is most commonly involved. In as many as 30% of cases, the rupture involves more than 1 chamber. Delayed myocardial rupture has been reported as a result of cardiac contusion. Acute mitral or tricuspid regurgitation, VSD, or pericardial tamponade may result from myocardial rupture secondary to blunt cardiac trauma. Penetrating myocardial injury occurs most commonly as a result of stab or gunshot wounds (see the image below). The cardiac chambers involved are, in decreasing order of frequency, the right ventricle, the left ventricle, the right atrium, and the left atrium. Photograph of heart of 43-year-old man demonstrating site of stab wound over left ventricular lateral free wall (shown as vertical tear). Unlike blunt trauma, penetrating cardiac injury always involves the pericardium. Consequently, ventricular free-wall rupture in this setting may result in either pericardial tamponade (if the pericardial wound is obliterated) or intrathoracic hemorrhage. Pericardial tamponade is more common with stab wounds, whereas hypovolemic shock is more frequently associated with gunshot wounds. Myocardial abscesses accompanying infective endocarditis may rupture transmurally, resulting in VSD or pericardial tamponade (pyohemopericardium). Such abscesses are observed most commonly in the setting of Staphylococcus aureus endocarditis involving prosthetic valves in the aortic position. Rarely, myocardial necrosis due to acute myocarditis, tuberculosis, or sarcoidosis may result in myocardial rupture. 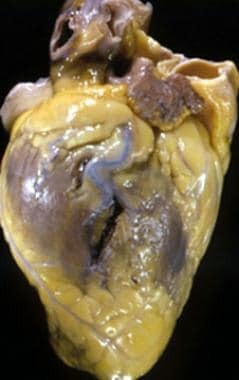 Myocardial rupture is rarely caused by primary tumors (eg, hemangiopericytoma, angiosarcoma, or lymphoma) or secondary (metastatic) cardiac tumors. Lymphomas and acute myeloblastic leukemia also have been associated with myocardial rupture. Rupture of a myocardial abscess or AMI secondary to coronary embolism of the vegetative material may occur in patients with infective endocarditis. Other infections may include tuberculosis, echinococcal cysts, and myocarditis. Aortic dissection may also be a cause. This occurs in the setting of an ascending aortic dissection with the rupture of the false lumen into the pericardial space, causing hemorrhagic cardiac tamponade or retrograde dissection into the left ventricular myocardium (myocardial hematoma). Primary or secondary (metastatic) tumors of the myocardium (including lymphoma and acute myeloblastic leukemia) may result in myocardial rupture involving any of the cardiac chambers. Sarcoidosis is a rare cause of myocardial rupture through transmural noncaseating granulomas. The highest risk of myocardial rupture in this setting is observed during aggressive anti-inflammatory (commonly steroid) therapy that may lead to rapid dissolution of granulomas. Myocardial rupture complicates as many as 10% of AMIs. Approximately 6-10% of penetrating chest wounds and 15-75% of blunt chest injuries are associated with cardiac trauma. Myocardial rupture occurs in 10-15% of fatal motor vehicle accidents. The incidence of cardiac rupture after blunt trauma is 0.5-2% among hospital trauma admissions. Myocardial rupture after AMI is more common in patients aged 60 years or older. Traumatic myocardial rupture is observed more commonly in those aged 15-63 years (mean, 34 years). Myocardial rupture after AMI is reported more commonly in women than in men (1.4:1). The incidence of traumatic myocardial rupture is higher in males (up to 85% in some series) than in females. The prognosis depends on the type, size, hemodynamic effects, and cause of the myocardial rupture. Accordingly, making a quick diagnosis and initiating prompt surgical intervention are crucial. Myocardial rupture is responsible for nearly 15% of all in-hospital deaths among patients with AMI. After pump failure, it is the second most common cause of in-hospital mortality among patients with AMI. Approximately 50% of patients with cardiac rupture after AMI die within 5 days, and 82% die within 2 weeks of the index infarction. Aggressive early diagnosis and surgery may confer a survival rate as high as 75%. The overall mortality from myocardial rupture after blunt trauma is 76-93%. However, among those who reach the hospital alive, the mortality is 29-50%. The mortality from myocardial rupture resulting from penetrating trauma ranges from 62-89% in the field to 2-83% in the hospital. Mortality after the patient arrives at the hospital largely depends on the type of injury, the rapidity of the transfer to a hospital, and the patient’s vital signs and condition on arrival. For myocardial rupture resulting from penetrating cardiac trauma, hospital mortality is higher in patients presenting with hypovolemia than in those presenting with pericardial tamponade (22% vs 8%). In-hospital mortality is lowest for patients with RV rupture. Helmy TA, Nicholson WJ, Lick S, Uretsky BF. Contained myocardial rupture: a variant linking complete and incomplete rupture. Heart. 2005 Feb. 91(2):e13. [Medline]. Okino S, Nishiyama K, Ando K, Nobuyoshi M. Thrombolysis increases the risk of free wall rupture in patients with acute myocardial infarction undergoing percutaneous coronary intervention. J Interv Cardiol. 2005 Jun. 18(3):167-72. [Medline]. Kumar S, Kaushik S, Nautiyal A, et al. Cardiac rupture in takotsubo cardiomyopathy: a systematic review. Clin Cardiol. 2011 Nov. 34(11):672-6. [Medline]. Dumont E, Rodés-Cabau J, De LaRochellière R, Lemieux J, Villeneuve J, Doyle D. Rapid pacing technique for preventing ventricular tears during transapical aortic valve replacement. J Card Surg. 2009 May-Jun. 24(3):295-8. [Medline]. Javaid MM, Grigoriou A, Katsianos D, Kon SP. Nephrotic and anti-phospholipid syndromes: Multisystem conditions associated with acute myocardial infarction in young patients. J Ren Care. 2011 Sep 14. [Medline]. Honda S, Asaumi Y, Yamane T, et al. Trends in the clinical and pathological characteristics of cardiac rupture in patients with acute myocardial infarction over 35 years. J Am Heart Assoc. 2014 Oct 20. 3(5):e000984. [Medline]. Suzuki M, Enomoto D, Seike F, Fujita S, Honda K. Clinical Features of Early Myocardial Rupture of Acute Myocardial Infarction. Angiology. 2011 Nov 8. [Medline]. Hayashi T, Hirano Y, Takai H, et al. Usefulness of ST-segment elevation in the inferior leads in predicting ventricular septal rupture in patients with anterior wall acute myocardial infarction. Am J Cardiol. 2005 Oct 15. 96(8):1037-41. [Medline]. Mehta RH, Grab JD, O'Brien SM, et al. Clinical characteristics and in-hospital outcomes of patients with cardiogenic shock undergoing coronary artery bypass surgery: insights from the Society of Thoracic Surgeons National Cardiac Database. Circulation. 2008 Feb 19. 117(7):876-85. [Medline]. Photograph of heart sectioned transversely at level of middle left ventricle showing posterior ventricular septal defect at site of recent acute myocardial infarction. Photograph of mitral valve and subvalvular apparatus showing site of ischemic papillary muscle (PM) rupture (R). Magnified photograph of transverse section of middle left ventricle (LV) showing transmural lateral free-wall rupture (R). Chest radiograph in posteroanterior projection showing large pseudoaneurysm manifesting as bulge in left cardiac border.